During the past twenty years, professionalism has been a concern frequently discussed among practicing thermographers. Few realize that true professionalism begins with the individual and is the responsibility of every member of the infrared community. Frequently it seems that thermography has matured more rapidly than some of its participants. The infrared industry has more than a few who seem to go out of their way to accentuate the negative either by word or by deed, often in a sensational fashion. Unfortunately, this behavior reflects on the thermographic community as a whole. Because professionalism is determined by those who practice thermography, it is incumbent upon every infrared professional to define our technology on a daily basis through their actions. If you are a practicing thermographer the following are some ways you can help to enhance the image of our profession. Lastly, when promoting your services or products, do so only in an honest and forthright manner. We invite infrared professionals to act responsibly and with integrity by adhering to the simple concepts outlined herein. Doing so will maintain and enhance the professional image of our technology. Training & Equipment: Which First? We’ve all heard the phrase, “Put the horse before the cart.” When it comes to thermography, many people put the cart in front of the proverbial horse by buying infrared equipment before obtaining proper training. Purchasing the correct imager is a challenge for many reasons: initial purchase price can be costly, no imager is capable of performing all applications, imager performance varies widely, and available specifications are frequently exaggerated. Further compounding this challenge is that many manufacturers offer “free training courses” as sales incentives to purchasers of new equipment. Frequently these free courses are taught by inexperienced/unqualified instructors, are introductory in nature, and are designed as operator courses for the subject equipment omitting important theory or applications. Because these courses are taught after equipment is delivered, inexperienced purchasers lack the knowledge required to make an informed decision when selecting new equipment. Infraspection Institute offers Level I, II, and III training and certification for thermographers worldwide. Our cutting-edge infrared training courses are taught by highly-experienced thermographers in a friendly, relaxed atmosphere without marketing hype. For more information call 609-239-4788 or visit us at www.infraspection.com. As individuals, most of us can appreciate the cooling effects of a breeze on a hot summer day. As thermographers, wind represents a greater technical challenge in the form of a potential error source when measuring temperatures radiometrically. As wind moves across the surface of an object, convective heat transfer occurs. In general, wind will either cool a warm target or warm a cool target. The rate of convective heat transfer will primarily depend upon: velocity of the wind, temperature differential between object and wind, and surface film coefficient of the object. Wind can significantly alter the temperature of an object while the windy condition is present. Frequently, the effects of wind may remain for a significant period of time after the wind has stopped and the object has returned to its normal temperature. Always allow sufficient time for target to return to normal temperature once wind has been eliminated. If it is not possible to avoid wind, one should report wind velocity and direction when recording image data. Lastly, thermographers should resist any temptation to apply ‘Wind Chill Charts’ to correcting for the effects of wind. Wind Chill charts have been designed to estimate the net effect of wind and ambient temperature on exposed human flesh and are not applicable to inanimate or industrial objects. Infrared inspections can be a valuable tool for detecting problems within electrical distribution systems. Understanding when and where to utilize thermography is key to obtaining optimum benefit. Infrared inspections can detect and document evidence of loose/deteriorated connections, overloaded circuits, imbalanced loads, harmonics, and defective equipment. In some cases, infrared inspections can detect evidence of problems that may be overlooked by traditional electrical testing. 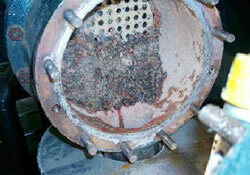 Infrared inspections should be used to supplement, but not replace, regular preventive maintenance. Lastly, infrared inspections should only be performed by certified infrared thermographers who are thoroughly familiar with the system(s) being inspected. For more information on thermographer training and certification or to obtain a copy of the Guideline for Infrared Inspection of Electrical and Mechanical Systems, contact Infraspection Institute at 609-239-4788 or visit us online at www.infraspection.com. As infrared technology has advanced, radiometers have become a common tool for many maintenance technicians and mechanics. Although radiometers are relatively easy to use, there are several important factors that influence the accuracy of a radiometer’s readings. Infrared radiometers offer several advantages when it comes to temperature measurements. Measurements are non-contact, non-destructive and can be obtained quickly. Unfortunately, radiometers are not self-diagnostic and cannot warn the operator of erroneous readings. The following are some simple tips that can help to ensure accurate infrared temperature measurements. Accurate emissivity and reflected temperature values should be input into the radiometer’s computer. Whenever possible, infrared readings should be correlated with known temperature values. If a discrepancy is observed, it could be due to a procedural error in measurement or the radiometer may require calibration. For more information on infrared temperature measurement, or to obtain information on thermographer training and certification, contact Infraspection Institute at 609-239-4788 or visit us online at www.infraspection.com. Despite the important role they play in a commercial facility, electric motors tend to be both out-of-sight and out-of-mind until they fail. Infrared thermography can be used as a cost-effective diagnostic tool for detecting problems within electric motor systems. Many infrared inspection programs include motor control circuits but overlook the motor itself. Evidence of several conditions which can lead to premature motor failure can be detected with a thermal imager. The following are suggestions for thermographically inspecting motors. With cover removed, inspect electrical connections at the motor junction box. This should be done in conjunction with the regularly scheduled inspection of the facility’s electrical system. When possible, qualitatively compare inboard and outboard bearings for each motor. If a large Delta T is present, it may be indicative of misalignment or a rotor balance problem. If both bearings are hot, the bearings may be worn or improperly lubricated. Because no complicated analysis is required, infrared inspections typically can be performed rapidly and at a fraction of the cost of other types of motor testing. Additionally, infrared can detect evidence of misalignment at lower thresholds than those detectable by vibration analysis and motor current signature analysis. Lastly, infrared inspections of motor bearings and stator should be performed monthly by experienced, certified infrared thermographers who thoroughly understand the theory and operation of electric motors. In regions with older infrastructure, sewer system integrity is often a primary concern. Under the right conditions, thermography can often detect sewer leaks or voids surrounding the system that can lead to sinkholes. In the case of sewer systems, thermal imaging is usually employed during evening hours after a sunny day. During the inspection, the thermal imager is maneuvered over the pathway of the subject sewer system looking for unusual thermal patterns. The imager may be operated on foot, from a motor vehicle or an aircraft. One should be aware that a negative finding does not necessarily mean defects are not present; they simply may not be detectable by thermal imaging. Conversely, positive findings can be caused by conditions other than leaks. Therefore, it will be necessary to verify all thermal data by visual inspection. The topic of infrared inspections of buried piping systems is covered in depth in our Level I Certified Infrared Thermographer™ classes. For more info on training and class dates, please call or visit us online at: www.infraspection.com. trained and experienced thermographer is able to identify and analyze those anomalies prior to costly failures occurring. Thermography is one of the tools used by the Bruce Power Predictive Maintenance group which was created last year. 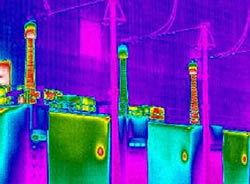 Four thermographers at Bruce B and two at Bruce A started to perform thermography inspections of electrical equipment. Baseline inspections have been completed to this point on the most critical equipment. An example of a recent successful deployment of thermography is detailed here. At Bruce A, Len Bridge and Bob Forrest performed a thermography inspection of the Unit 4 main output transformer. Elevated bushing temperatures revealed an imminent problem. Inspection results successfully confirmed that the cooler was plugged due to rust buildup. The pictures describe the story. In the infrared photograph shown at left, red phase and blue phase high voltage bushings are operating at higher temperatures than the white phase bushing. The thermography image led to the discovery of a rusty buildup (shown above) that was beginning to plug the coolers. As the popularity of infrared transmissive switchgear windows increases, many have begun to question how much windows attenuate the observed infrared data. With no standards governing the manufacture of switchgear windows, the answer can vary depending upon the make and model of the window and the selected infrared equipment. Infrared transmissive windows have seen increasing popularity as an alternative to opening electrical cabinets for infrared inspections. These windows typically contain an IR transmissive material supported in a metal frame and are permanently installed at strategic locations in the switchgear enclosure. During the infrared inspection the camera lens is placed against the window to inspect electrical components without having to open the subject enclosure. As no material on earth is 100% transmissive to infrared energy, all infrared windows will qualitatively and quantitatively attenuate the infrared energy passing through the window. While it is useful to know the transmittance of the window’s optical material, there are other important factors to be considered. It should be noted that there is no way to compensate for any of the common error sources listed below. Prior to installing switchgear windows, it is imperative to understand their applications and limitations. For more information on calculating the transmissivity of switchgear windows, consult the Guideline for Measuring and Compensating for Reflected Temperature, Emittance & Transmittance available from Infraspection Institute. When performing an infrared inspection of low slope roofing systems, invasive testing is necessary to confirm the composition and condition of roofing system components. As asphalt and coal tar are incompatible materials, it is imperative to use the correct bitumen to ensure the long term integrity of repaired test sites. Asphalt and coal tar are hydrocarbon materials commonly used for built-up roofing. While both share a common use in roofing, they are very different in their chemical composition. Asphalt is a petroleum distillate and a byproduct of crude oil refining. Coal tar is a bituminous product that is largely insoluble in petroleum distillates. If sample dissolves to black liquid – sample is asphalt; if sample remains intact and/or colors mineral spirits to a yellow/green color, sample is coal tar. Once bitumen type has been determined, one should use appropriate repair materials along with the same bitumen as indicated by the above test. Doing so will help to ensure the long term integrity of repaired test sites. Arc Flash Protection – How Much Do You Need? For those who work near exposed, energized electrical equipment, a popular question is, “How much arc flash protection do I need?” This week’s Tip focuses on two ways to answer this question. NFPA 70E mandates that Fire Resistant Clothing be worn whenever an employee is working within the Arc Flash Boundary. For equipment rated at 600 volts or less, the Flash Protection Boundary is 4.0 feet; this distance increases proportionally with available energy levels. The selected flash protection must provide thermal protection against the potential heat generated should an arc flash occur. The amount of heat associated with an arc flash is dependent upon the amount of energy available and the distance from the fault. The amount of energy available is dependent upon available fault current and clearing time for the fault. NFPA 70E provides two methods for determining how much FRC is needed. The first method involves utilizing an engineering calculation to determine the amount of energy available for subject components. Employing this formula usually requires the skills of an electrical engineer and specific information about the subject equipment including voltage, amperage and overcurrent protection. Protective clothing is selected based upon the amount of potential heat energy determined from the calculation. The second method utilizes a table listing electrical equipment and common work tasks. By identifying the work task and the category of subject electrical equipment, one may determine the Hazard/Risk Category associated with a specific task. Once the Hazard/Risk Category has been determined, a second table is utilized to determine the required PPE for the particular Hazard/Risk Category. Intrinsically safe test equipment is a requirement for workplaces where combustible gasses may be present. Prior to performing an infrared inspection in such areas, it is important to understand the meaning and importance of this requirement. Intrinsically safe is a term that applies to test instruments that will not produce sparks or thermal effects capable of igniting a flammable vapor. Intrinsically safe equipment is frequently required in mines, chemical refineries, and in areas where combustible gasses, vapors, or dust may collect. Using instrumentation other than intrinsically safe in these areas could cause a potentially lethal fire or explosion. Presently, most infrared inspection equipment is not rated as intrinsically safe. Because of this, infrared equipment not rated as intrinsically safe should never be operated in an area where combustible gasses or vapors are present. In areas where there is a potential of combustible gas accumulation, the area should be sampled for combustible gasses and oxygen content prior to the infrared inspection to ensure that the area is safe to enter. Once area has been deemed safe, the area should be continuously supplied with fresh air and monitored regularly during the inspection. Currently published industry standards require that core samples be obtained when performing infrared roof moisture surveys. Properly procuring and patching core sample sites can help to maintain watertight integrity of sample sites. Core sampling a roof involves physically removing a portion of the roof membrane and insulation layers to ascertain the composition and condition of roofing system components. Core samples may be square or round and range from a couple of inches in diameter to a several square feet in size. The following procedure outlines the steps in sampling and patching 2” diameter core samples on gravel-surfaced, built-up roofing systems. Center 6” diameter disk of 15 lb roofing felt over plug. Firmly press felt down to remove air pockets and fish mouths. Prior to sampling, determine if roof is under any warranty that could be voided by sampling. Always obtain permission to perform any invasive testing before you begin. Infrared thermography is frequently used for condition monitoring of refractory-lined vessels such as boilers, furnaces, reformers, and cat crackers. By inspecting these same vessels during different stages of start-up, one can find problems that may not be detected when the subject vessel is operating at full rates and temperature. 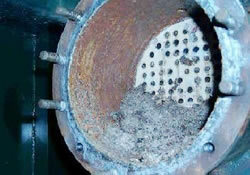 Within refractory-lined vessels, refractory will tend to expand as temperature increases. In a perfect world, there should be no detectable thermal anomalies during low temperature operation but, in fact, you may be able to readily detect refractory problems while the unit is operating at below normal temperatures. During startup, one may notice that some hot spots will disappear once the vessel has reached normal operating condition. This is because the refractory has expanded and sealed off cracks within the interior of the unit. It is not uncommon to see an exception that has reached near critical temperature to completely disappear or cool to an acceptable limit once the vessel has reached full rates. Hot spots remaining after startup may indicate serious problems and should be closely monitored. By identifying exceptions at lower operating temperatures, one may better predict where a future problem or failure may occur. For vessels subject to cyclical loading, these same areas are usually the first to deteriorate due to an excessive amount of expansion and contraction. When used as a quality assurance or condition monitoring tool, infrared thermography can help to avoid unnecessary or unexpected shutdowns thereby saving a facility valuable production time and money. Have a professional artist design a color brochure that fully describes your capabilities and strengths along with the benefits that customers can expect from your services. Engage a website professional to design a website that mirrors your advertising brochure. Whenever possible, choose a domain name that is easy to remember and contains your company name only. Be certain to update your website periodically. Network with other professionals that can bring you work through their business activities. Architects, engineers, contractors and consultants can be excellent strategic partners. Once you have established a relationship, you reap the benefit of their sales efforts at no cost. Once you have identified prospects within your region, hit the bricks and do some old fashioned selling. In this day of internet selling, email and instant messaging, putting a human face on your company can be worth its weight in gold. Lastly, advertise your company in an online directory where prospects are likely to visit. At present, IRINFO.ORG receives 250,000 visitors each year, many of whom are looking to hire an infrared professional. Listing your company in our Directory of IR Inspection Companies can mean the difference between working hard or hardly working. Many animals and even some people are credited with having a sixth sense for knowing or anticipating events before they happen. The benefits of this seemingly supernatural power can be enjoyed by applying a discipline known as situational awareness. Situational awareness is a technique that has been practiced by pilots and military personnel for several years. Situational awareness is a discipline that requires a person to be constantly aware of his/her surroundings and to constantly anticipate what might happen next. By constantly being aware of what might happen one is better able to plan an appropriate response before an event occurs, thereby avoiding surprises. Practicing situational awareness means that you plan for what could go wrong instead of what is likely to go wrong and have preplanned responses for any eventuality. Taking some time to practice situational awareness can vastly improve your personal safety by helping to eliminate surprises and the confusion that goes along with them. Ever wonder why magicians never reveal their secrets? It’s because magic, like most things, is easy once you know the trick. When describing thermography in lay terms, it is easy to over emphasize simplicity and forget the source of the true magic behind thermography – the thermographer. An infrared inspection system consists of infrared imaging equipment, a thermographer, and the knowledge that he/she possesses. Of these three things, the greatest limiting factor in an infrared inspection system is the thermographer. In addition to the above, qualified thermographers must also be experienced with inspecting the subject system. When all things are considered, effective thermographers need considerable training and field experience. Making thermography look simple is a true testament to the skills of a professional thermographer. The next time you hear the dismissive claim that thermography is easy, remember, it is only easy after someone has invested considerable time and effort to learn the art and science of the trade. In a magic show, the magic comes from the magician, not the wand. In thermography, the magic comes from the thermographer. You’ve probably heard the saying, “You can’t see the forest because of all the trees.” Sometimes thermographers can’t see visible discrepancies for the thermal imagery. Thermal imaging is a very powerful tool for detecting, displaying and recording thermal patterns across the surface of an object. With the high tech information that thermography provides, it’s often easy to overlook problems that are visually apparent. Taking some time to study your subjects and their surroundings can provide additional information that can aid in your analysis or even discover deficiencies that your thermal imager may not detect. Lastly, many published standards and specifications require visual inspections be performed simultaneously with thermographic testing. Taking the time to visually inspect your subjects may improve your diagnoses and help to ensure that your inspections are compliant with industry standards. When performing infrared inspections of branch circuit panels, lighting circuits will often appear warmer than adjacent circuits. If adjacent circuits are lightly loaded, the warmer circuits may be indicative of a normal condition or they may represent a more serious condition. For electrical panels with single-phase branch circuits, is often quite normal for lighting circuit circuits to appear warmer as they frequently have some of the highest loads within the panel. To confirm this, load readings should be obtained with a true RMS ammeter to determine that the subject breakers are operating within specifications. For long term use, it is recommended that circuits operate at less than 80% of their rated capacity. If lighting circuit breakers are used as switching devices, they must be rated as Switch Duty. Using non-switch-rated breakers can cause excess wear on the breaker contacts. To determine the integrity of breaker contacts, one should remove the breaker from service and perform a contact resistance test through the breaker with the breaker in the closed position. Such testing should be performed with a digital low resistance ohmmeter. If lighting circuits have fluorescent fixtures or other solid state devices connected to them, the circuits are likely to contain significant harmonic content. To determine if significant harmonics are present, the subject circuit should be tested with a harmonics analyzer. In lieu of testing a suspect breaker, you may wish to replace it with a new one and re-image the subject circuit to ascertain if the situation has improved. One of the most challenging aspects of performing infrared inspections involves directing a qualified assistant in outlining exceptions on the surface of the ground or an insulated roof. Thermographers who perform infrared inspections of flat roofs or underground piping systems often outline the perimeter of exceptions with spray paint. Directing a qualified assistant to accurately outline exceptions can be both time-consuming and frustrating. The following suggestions can help to speed inspections while preserving coworker relations. When outlining the perimeter of an exception, use a series of dots to outline the most prominent features of the exception. These dots can then be connected with a solid line once their location is deemed satisfactory. Depending upon weather and target conditions, spray painted lines will often show clearly within the thermal image. Using thermograms to document exceptions is a time-tested common practice in thermography. At times, this practice can be cumbersome and confusing, especially with large structures. Simply defined, thermograms are two-dimensional hardcopy images that represent the thermal patterns across the surface of an object. For years, thermographers have utilized film or paper to produce records of the imagery provided by their thermal imager. Traditionally, thermograms work well for small objects or for exceptions that are small in size. Whenever possible, obtain extra sets of drawings to be used as file copies or for field use. When utilized properly, drawings can serve as valuable reference tools enabling one to see “the big picture” that is often not possible with several small thermograms alone. With the end of the year upon us, we wish to follow in the grand tradition of saving our best for last. In this Tip of the Week, we address some of the most important issues facing predictive maintenance professionals. Inventory – Take time to reflect on your many blessings such as good health, family and friends. Reliability – Set time aside to appreciate having friends and relatives in whom you can confide and trust. Communication – Remember to share your feelings with all of the special people in your life by letting them know what they mean to you. Spreading cheer and holiday spirit is easy; it begins with each of us as we let others know how we feel about them. In a recent Tip of the Week, we suggested using architectural drawings to supplement, or as a substitute for, thermograms for large structures. Structural blueprints can also be used to reference locations when performing infrared inspections of large physical structures. Within the blueprint set for any large structure are individual floor plans which usually indicate the location of structural columns. Floor plan drawings are customarily laid out with column rows indicated by letters on one axis and numbers on the other. Using a combination of letters and numbers (A1, B1, etc.) to designate columns enables one to universally reference locations within a structure. Whenever possible, obtain extra sets of drawings to be used as file copies or for field use. When utilized properly, floor plan drawings can serve as valuable reference tools enabling everyone to “speak the same language” when it comes to properly referencing locations.